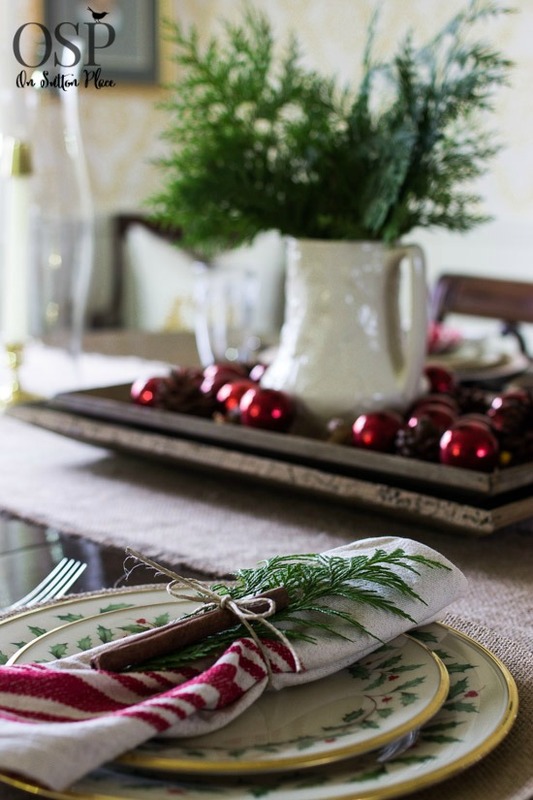 This year my Christmas table setting is simple and combines rustic with refined. 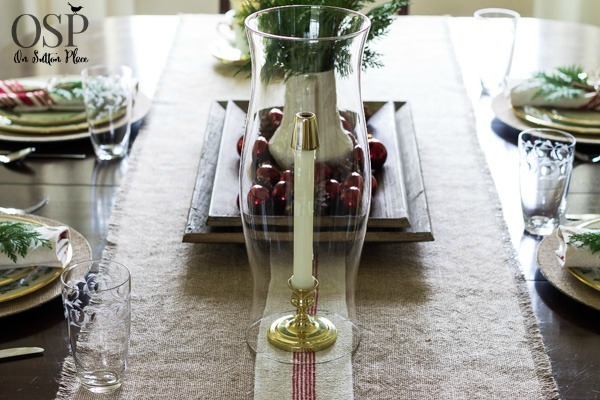 There is china and crystal paired with burlap and reclaimed wood. It most likely isn’t for everyone, but I like to use what I already have and this is what I came up with. I used the red balls and felt stars from last year’s stairway garland to dress up the chandelier. The centerpiece is a combination of my Painted Fox reclaimed wood trays, more red balls, pine cones and a pitcher of fresh cedar. I didn’t have a grain sack runner on hand (although there is one more left in my shop) so I used the burlap runner I made a few months ago and layered on a length of grain sack ribbon. I got the grainsack-inspired napkins at HomeGoods, tied them with twine, added fresh cedar and a cinnamon stick. The china was given to me by my husband over many Christmases. It took me years to get a full set but it was worth the wait. I remember the first Christmas I finally had enough place settings to actually use it. A good memory for sure. There you have it. I hope if you have Christmas dishes, I have inspired you to pull them out and put them to use. No sense in letting them sit in the cupboard. happy new year! i have so enjoyed your blog this year. i just discovered it this year. i purchased a stocking from you in december, i love it! it was so much fun to get it in the mail. the packaging was wonderful, thank you. i cannot wait to try the potato soup. very excitied for the year to come and your blog. love isaiah 9:6. Received the snowflakes but decided to hold back for next year. My stars I purchased dressed up several packages. I feel like a kindred spirit with you as I too have Lenox Christmas plates, started for me by my step mother. If you have time visit my blog to see my dining table this year using the plates. Ann, I love the simple and elegant together. It says, “Nothing stiff and pompous, but you are welcome here, and we only use the good stuff for special guests. You are special!” My favorite Lenox pattern. I have always wanted it. Beautiful!!! Thank you Sherry…you could not have said anything nicer. Ann, I just love your decorating style. I love your china and that it has been given to you over the years by your husband . Truly a perfect gift. I love looking at all your beautiful decor. Everything is always so well displayed. Great styling for sure and my taste exactly! Have a blessed Christmas with family and friends. Ann, every time I go to Hobby Lobby to purchase those burlap chargers, they are sold out! I have my mother’s Lenox china like yours without the Christmas design, and I thought it would look good with those chargers. How sweet that you husband added to your collection over the years! Love the way that you’ve set the table, and I hope that you’ll have all of your family around the table this Christmas! Thanks so much for your reply to my question about whether or not you put your china in the dishwasher. I tried to reply to your email, but I got a delivery failure notification. I received my stocking the other day and cannot wait to put it up by the fireplace. I love country, cottagge, and vintage things. I just love your website and all of your decorating ideas and looking forward to some really good recipes. I’d call this classy rustic & it’s lovely, Ann! I have those dishes, too. I just feel like a queen when we get to use them. Do you put them in the dishwasher? I haven’t yet, but I’d sure use them more often if I could. I have enjoyed your posts throughout this Christmas Season. I love the mixing of the old and new. I think the old brings back memories of times past and I like traditions. I have been inspired this past year to pick out a Christmas dish pattern and start building my collection. My husband sounds like yours, he finds collections I like and each year adds pieces to my collections. I have a pink depression glass collection and he has purchased me pieces from all over which always have a story with the purchase that adds interest to the collection. Merry Christmas to you and your family and keep the great posts coming! Thank you Kim…your husband sounds like a keeper! Merry Christmas to you too. Yummy! I can’t wait to see your recipe for potato soup! I’ve been collecting my Lenox (Winter Greetings) for several years – I love being surprised every Christmas by my children who work hard every year to supply me with new pieces! Your table decorations are beautiful! Your Christmas dishes are lovely, Ann. As always, I admire your simple but elegant approach to decor. It’s lovely! Just beautiful Ann, love the white pitcher with the wood trays! Just lovely as always. You even make the simple ideas look beautiful. I love your Lenox Christmas china. My daughter has the same pattern (without the Christmas design) and she loves it. Enjoying your newsletters very much during this holiday season. Simple elegant. Did you cover your plate chargers with the burlap or buy them? Hi Barbara! I got the burlap chargers at Hobby Lobby for a few dollars each! Again, I love everything you do, your style is so like mine. Your table looks lovely. You must be like the energizer bunny. I don’t know how you have the energy to do all that you do and do it so well!!! Your table looks lovely, as always. 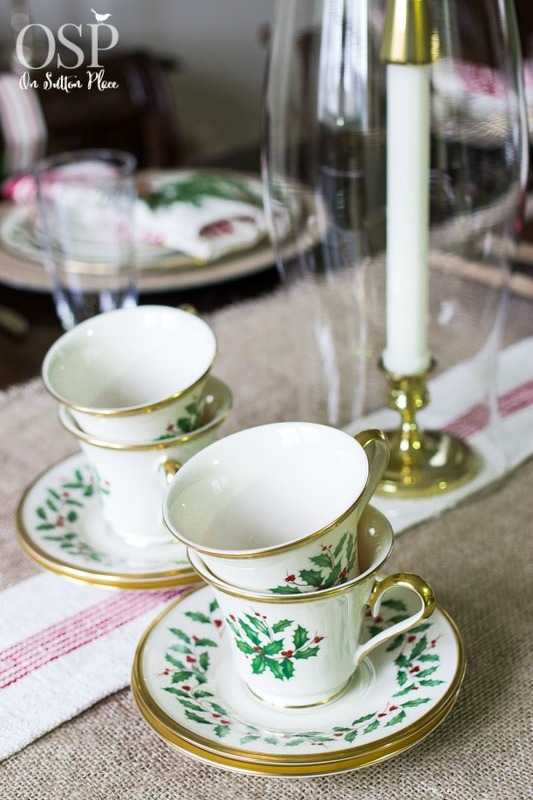 I love your Christmas china – beautiful pattern. I really love what you have done here. It is just right. A lovely blend of elegant and rustic and not over the top. I would love to replicate this look for my own table. Beautiful. So pretty and festive.Love it. Lovely! This is so much inspiration….. The dishes are amazing! Thank you! I love this Ann. The refined and rustic are an excellent combination and are so today! Love the fresh greenery too. Your photos are excellent. My first thought was her photos are always so crisp and sharp.You should do photo settings and photography tips. I like the burlap chargers. Did you buy or make them? I have the Lenox Holiday too. Need to use it more because I do love it. Have a wonderful Christmas. You inspire. Hi Bonnie…thank you so much! The burlap chargers are from Hobby Lobby and were only a few dollars each. Wishing you and yours a lovely Christmas! I inherited my mother’s same dishes. I have not used them yet. But my favorite piece to her collection is the Santa checking his list cookie jar. Hi Ann, Love,love your table. Pretty and rustic all in one. I love your china, so pretty. I hope you and your family have a wonderful Christmas. Thank you Barbie…Merry Christmas to you too! 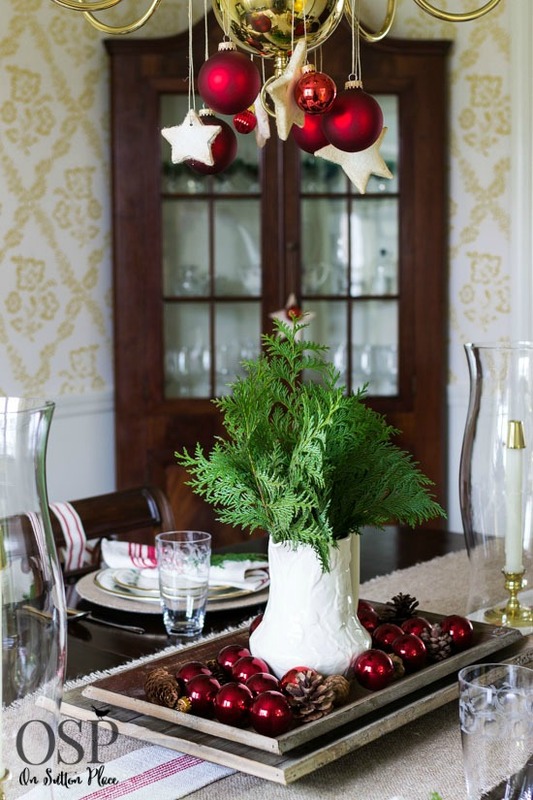 I love the way you use simple decorations and make them look elegant! 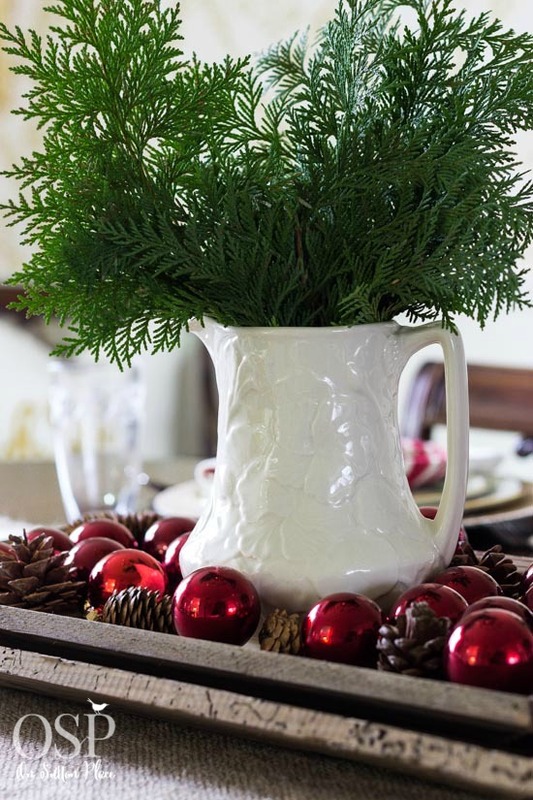 Also the use of fresh greens to add that little extra touch of Christmas. So simple, so elegant! I have the same set of dishes, & a beautiful vintage cream embroidered linen tablecloth on my husbands Grandparents dining set. Now I have some good ideas to dress it up. My house is very rustic by design. My husband & I built it ourselves. Not a look for everyone, but we love it. I am so glad I found your site…..birds of a feather we are. Thanks….Merry Christmas from Nevada! Hi Carol! The most important thing is that you love where you live…and I’m glad you do. Thank you for following along and Merry Christmas! 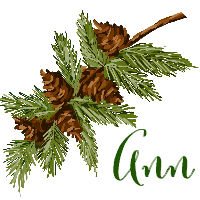 Ann you are my favorite blogger. My taste is most like yours. Do you have a book of your clever ,beautiful decorating tips? That is the highest of compliments and I thank you from the bottom of my heart. Love this! Simple, elegant, rustic – all at the same time. 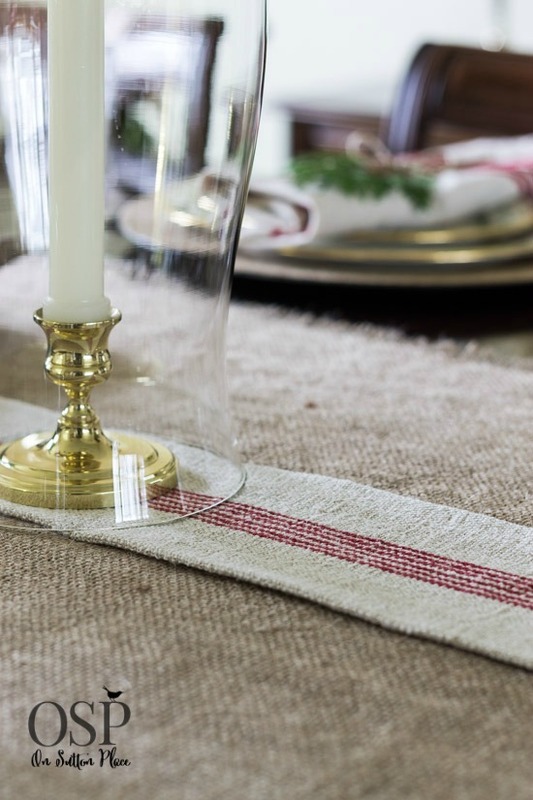 Did you make the round, burlap placemats? They give the appearance of a charger. Hi Karen! They are chargers and I got them at Hobby Lobby for a few dollars each. Merry Christmas! LOVE the look of simplicity on your table. Looking forward to your Sunday Supper Series….I have fond memories of Sunday suppers at my grandparents. Merry Christmas! You had me at “rustic with refined” :) Your table is beautiful! Merry Christmas, Ann! Thank you Jody! Merry Christmas to you and your family…best of luck in 2015 too! I love the simplicity of the table, plus the use of what you have. 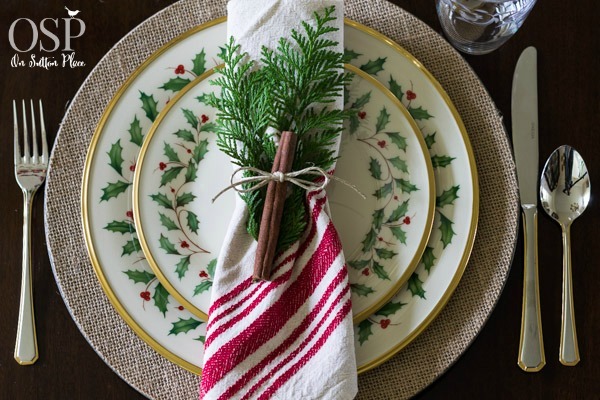 Everyone needs a set of white dishes and a set of Christmas dishes. The ideas for setting a table are limitless from there.. Thank you for renforcing the idea. You are so inspiring and I am going to set the table and decorate, finally, today! What a beautiful setting….. I have that same Christmas china and use it every meal in December! The grain sack ribbon was a clever addition to your burlap runner…. Thank you, Ann, for sharing your ideas. Love starting my day with viewing these pretty posts. I love the rustic and refined look you have created. It satisfies both my passions. All good choices especially since you used what you already have. Thanks for posting. You are welcome Diane…wishing you a Merry Christmas! Received my grain sack pillow cover.it is beautiful such great workmanship.i will enjoy this for many years to come. Thank you Ann, rose sparrows point md. You are most welcome…I am glad you are happy with your purchase. Happy Christmas! Oh i just LOVE your table! I have that same wonderful china! Although i LOVE the china…i sometimes struggle with decorating around it. I have always felt the need to dress “UP” to the china..which isn’t really my style. (i like comfort and casual…not all fancy and shiny). I would have never thought to combine wood and burlap with this china! It is really beautiful! Thanks for the inspiration! Merry Christmas to you! God Bless! I used to feel the same way Dana…and it was exhausting! I am trying to simplify yet still keep my traditions. Merry Christmas to you!